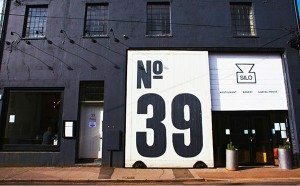 Even before Silo opened, they had created an exciting buzz around town. Previously a popular organic food store, most people I spoke to were pleased to hear that the wonderful space on 39 Upper Gardner street was going to be made of use again, especially that it was going to be the UK’s first zero waste restaurant, serving incredibly fresh, local, nutritious food. Silo’s dishes are based around the main ingredients themselves, using cooking techniques that highlight their natural flavours, without using any unnecessary processing along the way. The restaurant is decorated using all upcycled furniture and fittings, used jam jars for glasses, and they have a compost machine that all leftover food goes into, making use of anything that would usually go to waste. They make everything they possibly can themselves, including butter, cheese, hand milling flour, beer, cider and refreshing soft drinks. It is an incredibly inspiring concept and the passion behind the business really shows. 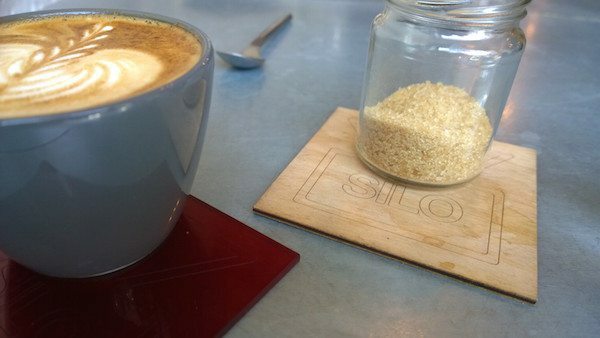 I was visiting with my partner on a Sunday lunchtime, and even though I had been wanting to go to Silo for ages, it was the first time that I had ever been. 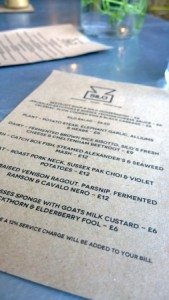 I was told that their menu was very gluten free friendly, and I was excited to go along to try a couple of their dishes to see how they could cater for someone who has to eat gluten free. It was a beautiful Sunday, and the restaurant was busy, we were arriving just as the menu was changing over from breakfast and lunch too. In the entrance way there is a long table covered in delicious looking homemade baking, including bread, cakes and pastries, and there were some interesting looking plates. 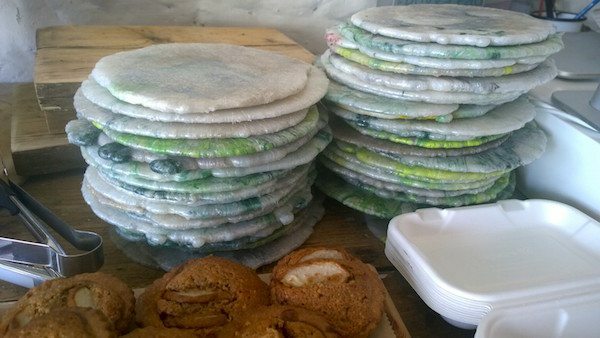 I asked the waiter that was seating us what they were made of, and he said that the Brighton University makes them for them out of recycled plastic carrier bags which I thought was pretty cool! We were seated in the corner by the window, just to the side of the kitchen so we had a great view of the chefs at work and getting ready for the changeover in menu. The menu was projected on the wall on two sides of the restaurant, so everyone had a view, but we were brought printed menus to look at too so it was a little easier to look through. We were brought a large carafe of water with some lovely green herbs inside, and jam jars for glasses too. The drinks menu is made of creative, home brewed beverages, which all sound amazing and it was hard to choose! I decided to try the Sencha Green Tea Kombucha which was sadly unavailable on the day, so I went for the Nettle iced tea which sounded wonderful anyway and my partner had a flat white. The iced tea arrived in a jar, and the flat white in a ceramic cup on a square coaster with the name Silo engraved. 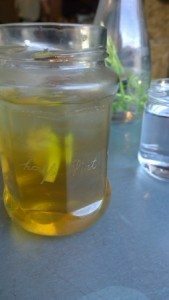 My iced tea was refreshing, and not too sweet, with a little acidity and the nettle had a lovely grassy flavour. The flat white was well crafted, with a little rosetta on top, and was sweet and creamy with bitter chocolate notes and cocoa. It’s nice to find a restaurant that serves decent coffee! The menu for lunch that day was filled with tasty items and it was really hard to make a decision. 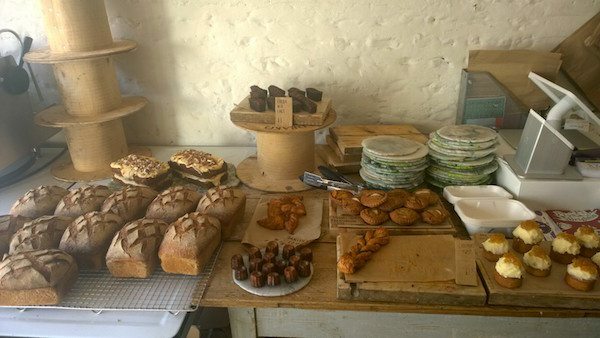 We were told that all the savoury dishes were gluten free, the bread that they make in house is using ancient grains that are much easier to digest and the rye bread that they also make in house has a small gluten content of 6%. They do have gluten free bread as well though, which is not yet made in house, but definitely something they are looking at milling and baking themselves in the future. After we had ordered we were brought our bread which came with house made butter, and served on the recycled plastic bag plates. 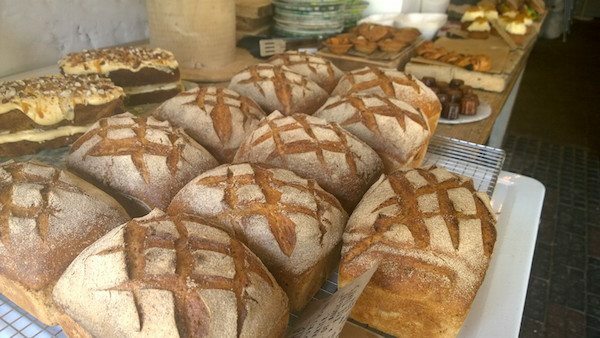 My partners bread was a sourdough made with Amaretto flour – a low protein grain that they milled into flour themselves. My gluten free bread was lovely and tasted fresh and homemade, so it was obviously sourced from a decent local supplier too. 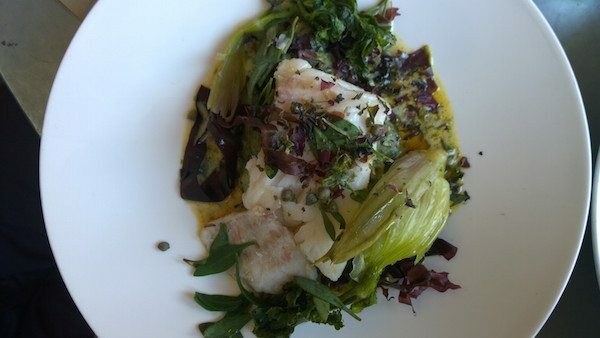 We had decided to share a starter, which arrived soon after, it was a Jerusalum Artichoke dish, which I was looking forward to as they are one of my favourite veg. Douglas the chef brought them to our table and carefully explained to us each ingredient with such passion that we knew it was going to be a special dish. He said that the Jerusalum artichokes were from Secrets Farm in Surrey, who use natural and organic pest management, and their soil is nutrient dense which really comes through in their produce. The artichokes were slow roasted until the skin was almost crispy, but the inside was soft and sweet to bring out the caramelised flavours of the vegetable. 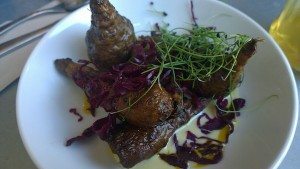 They were served with fermented red cabbage, garlic chives and Sussex cheese sauce, which all added their own element to the dish. The artichokes were definitely the nicest I had ever had, and I loved that they were easily the star component of the plate, with the fermented cabbage adding a subtle acidity, the slight kick of the garlic chives, and then the strong, but not overpowering cheesy sauce. I was truly blown away by the taste, and we nearly ordered another plate straight away! After pretty much licking the plate, it was taken away and we eagerly awaited our mains. It was nice to sit somewhere with such a local, bustling atmosphere and we didn’t have to wait long for our next course. Once again, Douglas explained each dish to us as he placed them on the table. I chose the Pork Neck with violet potatoes and Pak Choy and my partner went for the Catch Box fish with Seaweed mash after a recommendation I had from a friend who had had it a few days earlier. 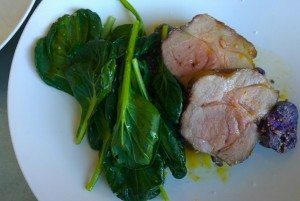 The pork was from Sheffield which is where Douglas is from, and the Pak Choy was locally grown in Sussex. There was a beautiful apple mustard jam on the side that really complimented the rest of the components on the dish. 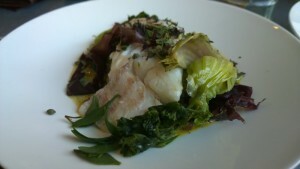 Douglas also explained there was a smoked English Grapeseed Oil which gave the plate a lovely, light smokey flavour too. The pork was deliciously tender, the pac choy packed flavour, and the violet potatoes were fluffy and light but still firm to bite. My partners fish was cod – catch box fish is where they serve whatever fish swims into their small fishing nets that day. It was so flaky and succulent, it was just cooked, so cooked to perfection. The seaweed mash tasted of the sea and was creamy and more ish, and there were steamed Alexanders on the plate too, which are a type of sea vegetable that were well cooked and tasted nutritious. There were a couple of desserts on the menu to choose from, but we were both feeling quite content after our food so we decided to give it a miss that day, but they did sound wonderful! We requested the bill and thanked the chefs in the open kitchen and walked out to the beautiful sunshine, feeling very pleased with our lunch and discussing when we would go back to eat there again. Silo’s passion and care is obvious, and they are not just fantastically ethical, they really know what they are doing with their food too. 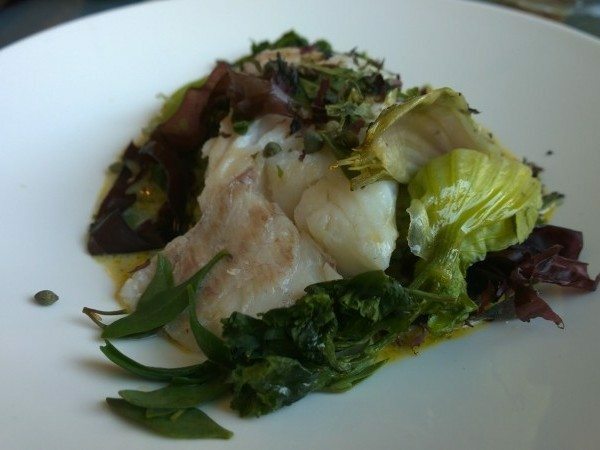 Don’t expect fine dining comforts as that’s not what they are about, but a casual, relaxed environment, with friendly, helpful service, and outstanding food that is unique and on par in quality with some of the best restaurants around.